Enjoy the best quotes / moments from Shadowhunters’ episode ‘Hail and Farewell’. In case you don’t remember what was this episode about or you’re not sure you’ve seen it, here is summary. Ordered chronologically as they appear in the episode. Isabelle Lightwood (to dead Sebastian Verlac): We’ll make ’em pay for what they did to you. Clary Fray: We’re going to make them pay for everything. Magnus Bane: The Queen is simply a woman with a strong point of view. Luke Garroway: Does that “strong point of view” differ from breaking the Accords? Because last time I checked, war with the Clave was the order of the day. Raphael Santiago: Unless Valentine succeeds in raising Raziel, kills everyone with demon blood first. Magnus Bane: In which case, she’d like to offer the entire Downworld protection in the Seelie Realm. Raphael Santiago: Whatever there is between us… it’s not just about craving each other’s blood. Isabelle Lightwood: I know. I know. Raphael Santiago: Well… If there’s any good that comes out of being at the brink of war… it’s being able to stand here, in front of you. Maia Roberts: Who knew dating a college boy would come in handy. Simon Lewis: No, no! It was the word college! I mean, I haven’t been to school in forever! Classes started like a week ago, and my mom already paid the meal plan. And I don’t even eat anymore! So she’s out, like, three grand, and then… Wait… are we dating? Clary Fray: Yeah, you switched pants with me so that nobody would notice. Simon Lewis: And I was never invited to another one of his birthday parties ever again. That’s awkward. This is us. Simon Lewis: You know I always have your back, Fray. And there’s no job that’s too big. Clary Fray: I need you to talk to the Seelie Queen. Simon Lewis: That job’s too big. Valentine Morgenstern: Are you with me? Sebastian Morgenstern: Until the bitter end. Simon Lewis: You were a child, and now you’re… confusing. Seelie Queen: Different outfits for different occasions. Seelie Queen: So long as you’re at my side when the wind changes, not a single hair on that perfect head of yours will be tousled. Simon Lewis: You don’t want things to end well, do you? You want war. Seelie Queen: I want change… and you, Daylighter. Seelie Queen: You’ve refused me twice now. No one, in my very long life, has ever dared do such a thing. Simon Lewis: Well… Considering you’re trying to get vampires, werewolves and warlocks to play nice… you might wanna get used to some rejection. Sebastian Morgenstern: I’m a dead weight, am I? I know when I’m being played. Valentine Morgenstern: Believe me. Where I need to go, it’s too dangerous for you to follow. You, Jonathan Morgenstern, are brilliant… and as cunning and vicious as I have ever hoped for. Listen to me. I will come back for you. I promise. Sebastian Morgenstern (to Jace): You’ll make an excellent trophy to present father with. Jace Herondale: People die in war, Clary. Clary Fray: My mom and then Dot, and… I can’t lose you, too. 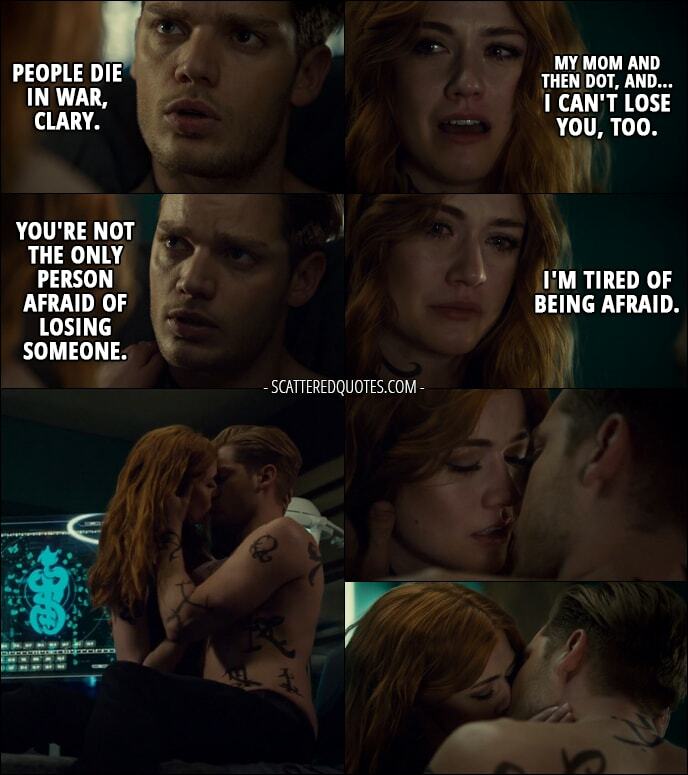 Jace Herondale: You’re not the only person afraid of losing someone. Clary Fray: I’m tired of being afraid. Valentine Morgenstern: I’ve come make you a deal. Seelie Queen: Hah! What could you have that I would possibly want? (Valentine whispers something in her ear) Walk with me, won’t you? It’s such a lovely night. Valentine Morgenstern: Though not so beautiful as what tomorrow may bring to the both of us.